So far, the focus of these blog posts has been on either the sitters depicted in the glass plates, or upon the physical process of digitising and researching the collection. Little has been said about the photographer himself. 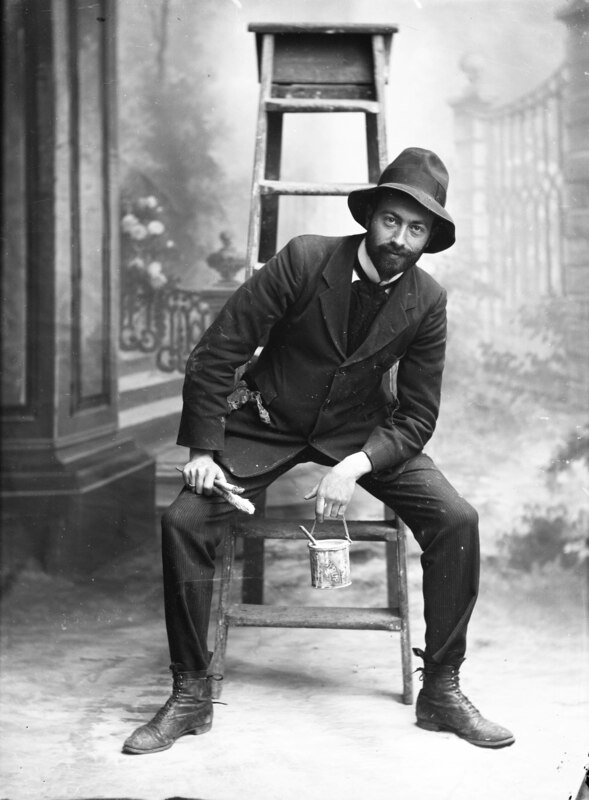 David Knights-Whittome was a talented, self-taught (we assume) photographer who worked in the local area for a period spanning from about 1905 until 1917, after which he appears to have abandoned photography as a career altogether. 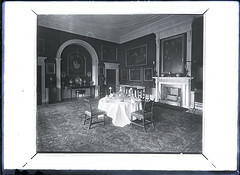 We are lucky enough to have been in direct contact with the Knights-Whittome family since the Borough acquired the glass plates, and from this source we have also acquired some documents, albums, notebooks and ledgers and a series of family anecdotes which have enabled us to build a good, if not fully detailed picture of the man behind the lens. So who was he? David Knights Whittome was born on the 29 of December 1876 in Greenwich, to Joseph Whittome, both a warehouseman and Baptist minister, and Eunice Smith. David was the youngest of seven children, three of which died in infancy. He appears to have started hyphenating his name about 1905, although not consistently at first, and nor do we have evidence to explain this decision. We know from discussions with the family and from prints in family albums that Knights-Whittome was working as a photographer long before the opening of the Sutton and Epsom shops. The COPY1 collection at The National Archives provides us with evidence that he was working out of The County Studio, Hereford in 1897. We believe this was probably the studio of W H Bustin and Son – one of the most important photographers in Hereford. This may have been for a short period as we also know he was working in Edmonton about the same time – probably living with his parents. According to information provided by his son Maurice Knights-Whittome, he worked for Russells, the court photographers with whom he went to Russia. Sadly we have been unable to find hard evidence of any travel to Russia. However, the records of the Royal Photographic Society show that he was a member from 1896 to 1905, giving his address as 13 High Street, Windsor – this was one of James Russell & Sons’ shops. David moved to Sutton about 1904 and opened a shop in Epsom in 1911. Both Sutton and Epsom shops remained open until around 1918. We are unclear about his photographic training although assume that he was largely self taught. A notebook dated 1894 (putting him at age 18) entitled the ‘Secrets of Photography’ includes a number of excerpts and insights from photographic books and manuals which demonstrate a keen interest in both technical and creative aspects of photography. He was married on 4 June 1907 to Sarah Elizabeth Draper (known as Bessie) in Hertford. 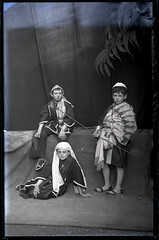 He gave his profession as Artist and Photographer and his residence as Sutton. 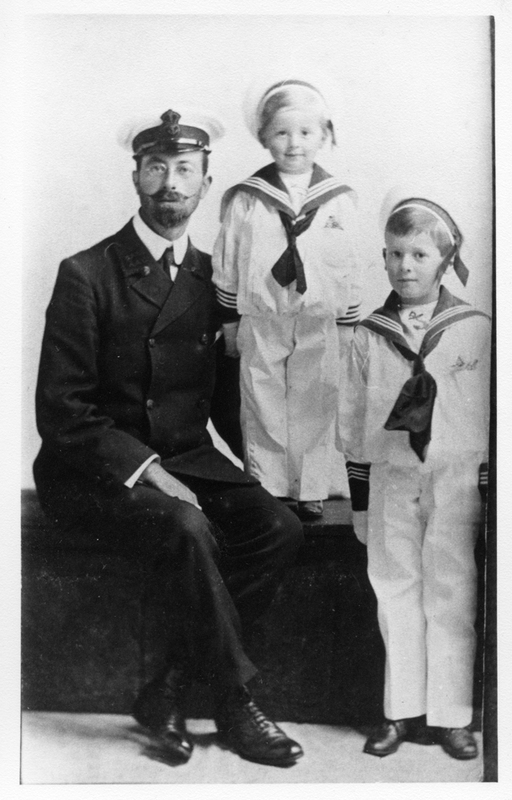 The couple had two sons: Ronald and Maurice. 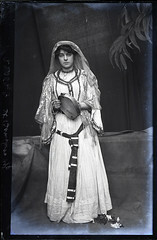 Sarah Elizabeth Draper (Mrs Knights-Whittome), taken in 1916. The family at home in Sutton. Knights-Whittome obtained a Royal Warrant of Appointment in 1911 having photographed the Royal Family over a number of years. He subsequently advertised himself as ‘Photographer to the King’. He photographed three generations of the British Royal family (Edward VII, George V and the future Edward VIII) in formal portrait shoots, country house parties and as part of a larger ‘press pack’ at events such as the investiture of the Prince of Wales at Caernarfon Castle in 1911. He also photographed other Royals such as King Alfonso of Spain, King Manuel of Portugal and the Queen of Norway. With the outbreak of war, David was attested as a Special Constable on the 14 August 1914 and served in that capacity locally until the 31 December 1914 after which he joined the Royal Naval Volunteer Reserve and then in 1916 transferred to the Royal Garrison Artillery, Special Reserve, as a 2nd Lieutenant. At some point, which is unclear, he ceased his photographic work (we have plates dated 1917/18). It is clear from correspondence in 1921 with the Royal Warrant Holders Association that he was no longer working as a photographer in Sutton or Epsom. By that time David, Bessie and their sons had moved to Wimbledon where the boys attended King’s College School. In 1923 the family moved to Bournemouth where Bessie had a shop. The boys were founder pupils at the newly opened Canford School. By the early 1930s David and Bessie retired and went to live in St Albans where David was very active in community life including being elected to both the City and County Councils. 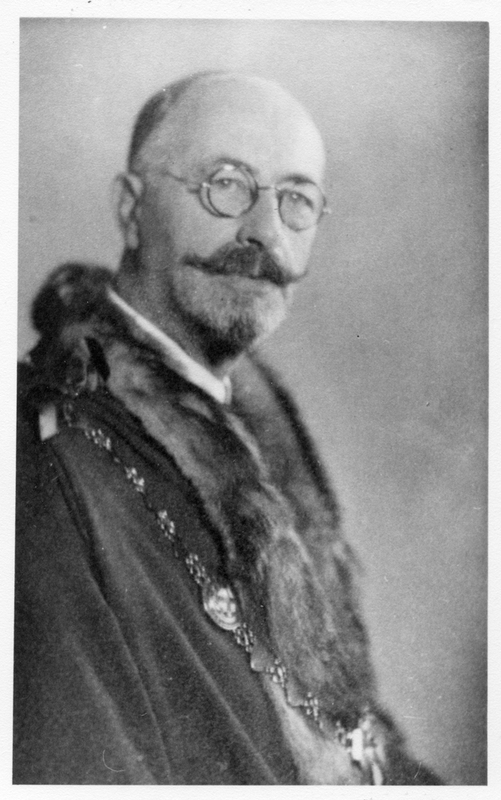 He was mayor of St Albans in 1940-41. David died 4 November 1943 and is buried at Sandridge, St Albans. Taken together, this timeline of dates and information builds a picture of a driven, talented, ambitious and successful man, but the images we have reveal far more about the man that the facts alone. Knowing the path DKW’s career eventually took, it would be easy to overlook the artistic spirit behind this photographic collection; it would be easy to imagine a slightly stuffy looking middle aged man in a suit. The images we have reveal, on the contrary, a good looking, slightly bohemian looking young man with a twinkle in his eye and a beautiful young family. 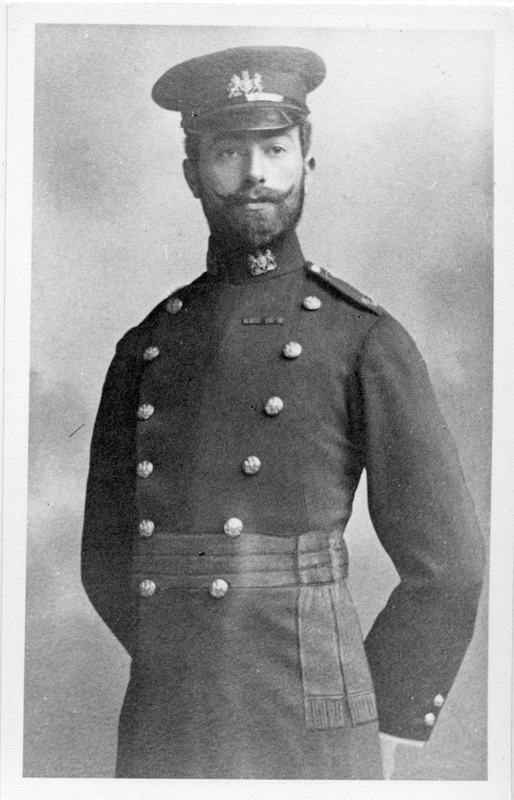 More formal portraits in military uniform, and later in his mayoral chains show a deep sense of pride and dignity – and a lifelong luxuriant moustache, a nod to his artistic sensibilities. This is the power of photographic imagery, to add colour and texture to historical fact; to add weight to the spirit and personality behind the lists of facts, dates and places which accompany them. Sadly, we may never uncover the stories behind some of Knights-Whittome’s sitters but looking into the eyes of these subjects and imagining their lives is one of the great pleasures of working with this collection. Abby Matthews, Project Officer, The Past on Glass. Knights-Whittome, posed in the studio ‘painting’ his backdrops.